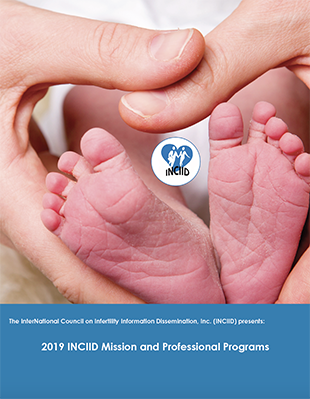 Professional membership supports INCIID's Charity Mission to help individuals and couples explore their family-building options. This means directing them to the appropriate care with a specialist or reproductive endocrinologist. INCIID also provides current information and immediate support regarding the diagnosis, treatment, and prevention of infertility and pregnancy loss, and offers guidance to those considering adoption or childfree lifestyles. 2019, INCIID staffing includes professional instructional design professionals certified for design management and development of E-Learning modules. INCIID can provide your clinic with quality instructional design, advanced audio and video production snippets or other projects to promote your practice or clinic. Professional members receive a full biographical listing in the INCIID Directory, where patients can search by state or by zip code . The listing includes Google mapping, address, and location, phone, fax, professional certifications, awards and area of specialty. Members can update their profile, add links or advertise clinic events such as seminars and workshops for consumers. As a professional member INCIID will also list your clinic events on our calendar or notify consumers in our newsletter. We invite all our members to publish consumer articles or even collaborate on learning modules to educate consumers. These modules and articles show consumers that physicians care about their struggle with infertility and pregnancy loss. An educated patient is a benefit to the clinic team. Seventy-five percent of learning occurs through vision. Therefore, Visual literacy is of paramount importance for learning. Visual literacy develops a patient's ability to comprehend, make meaning of, and communicate adequately. Research evidence supports the premise that strong positive relationships between a clinic's team member’s promotes a patient’s capacity to follow through with medical recommendations. Studies over the last several decades conclude clinics and their staff's ability to explain, listen and empathize have a profound effect on health outcomes and patient satisfaction with their experience. INCIID professional members have their profiles in front of consumers on the INCIID Website - the first infertility site on the web in 1995. We have thousands of individual visitors every month. INCIID subscribes to the principles of instructional design and foundations for learning on all professional member profiles. This includes a visual approach to learning. We will work with each individual or individual clinic to design an approach that is visual and communicates with the patients. We have a number of physicians that support our Scholarship program - this alone endears patients to physicians who are willing to give back to the community. Cost is approximately a dollar a day. A premium value. If you have questions about professional membership, please contact us either by email or phone (703) 379-9178. INCIID Corporate Sponsor Members are Corporations that donate ($3000 or more ) annually. We have a variety of sponsorships that INCIID will individualize to the needs of the corporation. To inquire about donating services to the INCIID IVF Scholarship Program, please contact us either by email or phone (703) 379-9178. Clinics tell us that participation is very rewarding. Patients who can afford treatment tell us they want to support programs that support other infertility patients who cannot afford treatment. Your support of the infertility consumer in the form of INCIID Professional Membership, Partnership or Corporate Membership will support the important work we do. Infertile consumers who do have access to treatment are most appreciative of an effort on the part of generous physicians and clinics to support infertility consumers. INCIID supporting Doctors with Heart go above and beyond the norm to support consumers - and consumers, in turn, want to support clinics who give back to the community.